After taking a big bump on the forehead last weekend, which required stitches, I'm so glad that my baby girl is feeling better and back to her curious toddler self. Here's a favorite shot of her from a mini session I did the other day. She was playing peek a boo with the sheer curtains in our bedroom and peeked out the window when she heard her siblings outside. I was having fun playing with shooting through the sheers for a hazy effect. 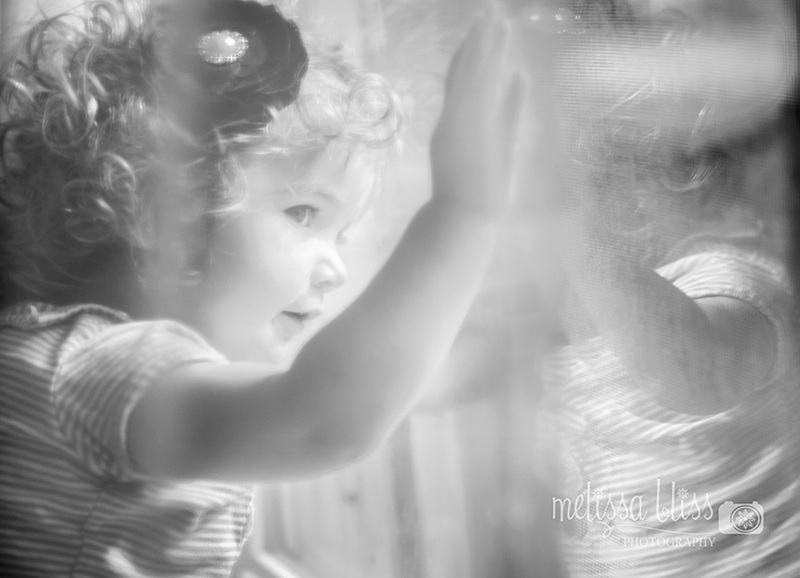 I like the way it gives an aged feel to the image and I love that I caught a bit of her reflection in the window. Tomorrow is my birthday and I'm doing my best to age gracefully, ha ha. I'm not thrilled to be inching toward 40. Our celebration will be low key and that's fine by me. The new camera and lens hubs bought me in May more than suffice as a birthday gift! Besides, moments like this one that I captured with that camera are more of a treasure than anything that comes wrapped in ribbons. I'll be posting a few more images from this session on Sunday, so check back then, or sign up for my feed so you don't miss a post! That might be one of my favorites ever! I love this! Glad she is feeling better after her bump. Hope your birthday was great!